LEXINGTON, KY – The Rotary Club of Lexington will hold its weekly meeting Thursday, October 11th, at the Red Mile, 1200 Red Mile Road. The program’s guest speaker was UK Women’s Basketball Head Coach, Matthew Mitchell. Mitchell’s teams are known for using three “winning tools” for success: honesty, hard work and discipline. So it’s no surprise that six seasons into his tenure as head coach he became the winningest head coach in program history. Now entering his eleventh season, Mitchell holds 271 wins and year after year assembles teams who are synonymous with winning on and off the court. Let’s hope the coaches at this years NCAA tournament are as hard working as Matthew is. A lot of basketball fans cannot wait for this season, which is why they have already looked into sites like https://www.interbasket.net/brackets/ncaa-tournament/womens/ to print out their annual tournament chart, where they predict who they think will win each game. It’s all about having fun when it comes to this aspect of basketball for the fans. But when it comes to the coaches and their teams, it is very serious when they step onto the court. 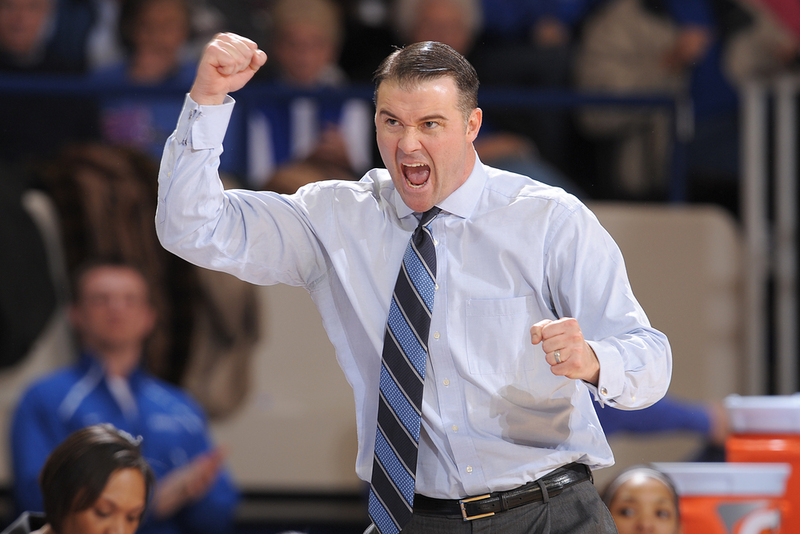 Mitchell’s defensive philosophy, implemented at the beginning of the 2009-10 season, was a big reason for Kentucky’s recent success. The Wildcats used a full-court, trapping, pressure style of defense that was dubbed by many as “40 minutes of dread.” But the 2015-16 season brought a different pillar of success for the program, combining Mitchell’s emphasis on defensive fundamentals with one of the best shooting offenses in school history. The Wildcats shot 45.5% from the field in 2015-16, which was the highest field-goal percentage for a UK team since 1989- 90, while its 35.6% from 3 was the highest since 2002-03. The balanced attack continued on both sides last season as Mitchell’s 2016-17 team had a .427 field-goal percentage, scoring 70.9 points per game. The Wildcats committed only 14.7 personal fouls and 11.9 turnovers per game, which ranked top 10 nationally. UK finished the season with 22 wins, marking its eighth straight 20-win season under Mitchell, which is a program record. The solid season led the Wildcats to another school record as UK played the NCA Tournament for the eighth straight season and hosted the first and second rounds of the event for the fourth straight year. Mitchell’s teams have brought excitement to women’s basketball in the Bluegrass like never before. The Cats have ranked in the top 25 in average attendance all 10 years of the Mitchell era and have a remarkable 125-17 record at home since the start of the 2009-10 season. Under Mitchell, 16 different players have received All-SEC accolades. A UK player has won the AP SEC Player of the Year four of the last eight seasons and five of his players have been WNBA draft picks, including three in the first round. Most recently, Mitchell helped Evelyn Akhator become the highest drafted player in program history as she went third overall to the Dallas Wings in the 2017 WNBA Draft. His players also excel in the classroom as 34 Wildcats have been SEC Academic Honor Roll members and 100 percent of Mitchell’s players have received their degrees. The Mitchell’s are very active in community service. In addition to a 10-year donation to the UK Athletics Department, they launched The Mitchell Family Foundation to benefit charities in the Lexington community. The first fund-raising event of the Foundation in September 2014 brought in renowned author and leadership expert, John C. Maxwell. In October of 2016, Matthew and Jenna were presented the 2016 Community Service Award by the National Urban League of Lexington. Jenna also serves on the board of the Children’s Advocacy Center and Matthew, of course, is an honorary member of our club.